The name Familia Martinez Bujanda is synonymous with high-quality Spanish wine. With five wineries in three different Spanish Denominations of Origin, Familia Martinez Bujanda’s wineries have one commonality: They strive to pick the best grapes from their own land instead of purchasing grapes from area growers. Finca Antigua's rock-filled wall and reservoir. They also see their wineries as being more than just a place making wine. At the DO La Mancha bodega, Finca Antigua, the facility is an architectural masterpiece. 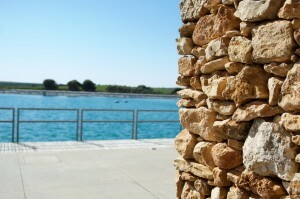 At the front of the winery is a 20-million liter manmade reservoir that is as blue and beautiful as the waters off the coast of Malta. The building’s entrance is a magnificent rock structure with a breezeway of local rocks held tightly together. The ceiling looks as if the rocks could topple on you at any moment, but grit and strong wires safely secure them. Inside are state-of-the-art facilities with a tasting room overlooking the nearly 1,000-hectare estate. Based in Los Hinojosos, Cuenca, Finca Antigua’s avant-garde architecture is perhaps the finest-looking newly made structure in all of La Mancha. In fact, the family was close to purchasing property DO Navarra. But, when they learned the vineyard with the highest elevation in the Cuenca Province was for sale, Familia Martinez Bujanda purchased it. The area’s stony soil, elevation and unique microclimate, due to the amount of trees planted near the vineyards, give Finca Antigua the freedom to experiment with different grape varieties, Martin says. Plus, DO La Mancha allows 13 different grapes to be grown compared to the family’s other DOs that are more restrictive. Currently, Finca Antigua is growing Moscatel, Tempranillo, Cabernet Sauvignon, Merlot, Syrah, Petit Verdot, Garnacha and Viura. 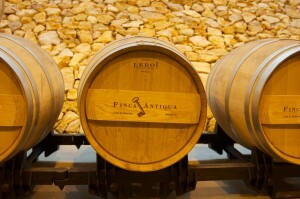 I personally wish more La Mancha wineries would follow Finca Antigua’s lead. They set the bar for a beautiful facility that adds to the romance of wine. This winery does not feel like a corporation or a business. It feels like a slice of heaven with a glass of Tempranillo. But, it’s not just Finca Antigua’s look. Their wine is really nice. Deep red color with purple hues. A complex nose of balsamic, eucalyptus, dark cherry and red fruits with hints of rose petals and vanilla. On the palate, it’s lovely silky tannins lead into a rounded chocolate finish. This wine stays with you for seconds after tasting. Purple color. Intense aromas of strawberry, dark cherry, rosemary, mint and citrus. Tasting is filled with blackberry, blueberry, fig and it’s very creamy and well structured. A smooth, rounded finish with a lovely aftertaste. Sorrento lemon yellow color. A clean, fresh nose with citrus and white flowers. A velvety, crisp palate meets notes of licorice, citrus and fennel. This is just a wonderful summer white wine.